Citation: Adámy L, Soltész K, Szládovics L, et al.. The effects of contested divorce on children’s emotional state based on their family drawings and life quality. 2018;2(1):1-7. The aim of this study: Understanding children and adolescents who experienced contested divorce, focusing on the aspects of their emotional experiences in the family, their overall mood and quality of life. Method: Comparing children who experienced contested divorce with those who live in a complete family, based on drawing tests and questionnaires (Inventar zur Erfassung der Lebensqualität bei Kindern und Jugendlichen - ILK). There were 21 people in the examined group and 21 in the control group. The answers to the questionnaires (ILK) gave us information about life quality, while drawing tests showed the bonding patterns inside families and the extent of family dissonance. Results: Looking at family ties, based in the ILK questionnaire we did not find any differences between the examined group and the control group. However, drawings of the examined group held more signs of dissonance than the control group’s. In the case of bonding there wasn’t significant difference between the groups. In the examined group, the signs of dissonance and bonding signs showed correlation. Conclusions: Signs of dissonance in drawings apparently show that family disharmony has a strong impact on children and adolescents. Contradictory results in the questionnaire point out that while children might not express verbally their issues with the family, projective drawing tests susceptibly mark those feelings. In these days several researches can be found that focus on divorce and the effects of divorce on children [1-3]. Amato  used meta-analysis to study the difference between children with married and divorced parents. In result it turned out that children with divorced parents scored significantly lower regarding their academic achievement, conduct, psychological adjustment, self-concept and social relations. Divorce affects not only the child’s present but their future as well. Amato and Sobolewski  studied people with divorced parents for seventeen years. The results show that marital conflict and divorce has an impact on the child’s adulthood, which is influenced by the relationship with each parent. Besides this, there are quite a few factors that determine the experiences forming in a person during a divorce. Such factor for example is the dynamics of the family. Based on research , children whose family lacks of serious conflicts and loud fights tend to experience divorce a bigger tragedy than those whose family is the other way around [7,8] emphasizes the fact that more and more children grow up with only one parent. They observed that because of the instable family structure these children and adolescents are more likely to violate rules, have poorer social networks, start abusing alcohol and drugs sooner, or move away from home earlier. Next to these Potter  mentions worse educational achievement as the result of negative effects. Arkes  examined children with divorced parents from the age 7 to 14. He was interested in the change of their academic performance: mathematics, reading and literacy. Comparing this to the Behavioral Problems Index (BPI) filled out by these children's mother, it turned out that divorce and marital conflict both have a measurable effect on children’s educational achievements and behavioral problems. Issues start 2-4 years before the divorce and remain or intensify after it . During their meta-analysis  found that children of divorced parents are exposed to more dangers. They are more likely to use drugs, commit crimes, start their sexual life early, have relationship problems, and get married too soon, usually below 20 years . The same was verified in the research of Anderson . He found that divorced parents have damaged relationships with their offsprings and this is why they are endangered: they start living their sexual life sooner, they are less likely to get married, but if they do, they are more likely to get divorced. Their educational achievement is worse and Anderson could even prove that these children are less healthy than those who grow up in a complete family . Stoschein  included 2418 children in his research which focused on the time of the divorce, as well as the second and the fourth year after it. Based on interviewing parents it became clear that the interaction between the precedent of parents parting and family disfunction indicates that the antisocial behaviour of the child decreases if marriage in outstandingly disfunctional families comes to an end . Paquette  used is own research to define the difference between the importance of a mother and a father and the father. It is known that while discovering the environment children return to their mothers for “emotional fuel”, but from this study it becomes clear that the children’s openness to the world is facilitated by their fathers. Therefore the preserence of both parents is equally needed for the children’s healthy development. Danckaerts  think that life quality is described by the subjectively perceived role in life, through one’s psychological, physical and social functioning. Several things affect the quality of life, such as family, friends, culture, and social economic state or . In this research we also focus on life quality in divorced and complete families as well. In our research we focus on inspecting the mental state of children who experienced contested divorce. Uncertainty and instability are one of the main characteristics of this event. Uncertainty can be caused by the environment, social expectations and the person’s cognitive processes and formal experiences . Their results support our idea that divorce, especially contested divorce might cause or increase the feeling of uncertainty in children. Uncertainty has a lot of elements and we can assume its preserence from many signs. Projective drawing tests for example are a great way to detect such feelings. During these tests one is totally free to express themselves and the final picture holds lots of information including the feelings of this person. For instance, it is a telltale if the size of the drawing is a lot different than most drawings. It counts as a markable difference if the size of the drawing is smaller or bigger by 25% than the average. This sign is related to self-expansion and self-esteem. Based on several researches a small drawing in projective drawing test leads to the conclusion that the person feels themselves small and inadecvate and their response to the challenges of life is driven by their low self-esteem . Baltrusch  thought that a drawing’s small size is parallel with the drawer’s uncertainty. Drawing tests are particularly beneficial when monitoring children’s mental state because their drawings hold more signs than adults’, especially those’ s who have psychological issues . Children are able to use colours on purpose, pairing sympathetic characters with colours they like and negative characters with colours they like less . Besides colours the way of representing the members of the family is also considered symbolical. Missing or huge body parts, irrational elements and the absence of feminity are all signs of uncertain bonding. Internalization problems are detectable through bizarre elements in girls’ drawings, while in boys’ drawings through the distance from the mother, the placement of figures and the preserence of odd objects . Securely bonding children draw ground and represent the members of the family proportionally. In insecure-avoiding children’s drawings the figures are small and floating, ambivalent/resistant children usually draw too big or encapsulated figures, figures separated with a wall or figures with missing body parts . Researchers can detect bonding issues by examining drawings, and it works the other way around too: Fury, Carlson and Sroufre  were able to predict the signs of children’s drawings by knowing their early bonding patterns. Parent’s behavior, family chaos and disharmony show on children’s drawings as well. For the optimal development everyday disorganization is more harmful than periodic instability . Based on many researchers’ work it is safe to say that in most cases divorce in itself has a negative impact on children’s mental state. The change of circumstances creates situations out of the ordinary to which parents must help adapt. However, during a contested divorce the behavior of the parents presumably isn’t always beneficial for the child. All this represents itself in the child’s general mood, attitude and drawings. In this research we examine these psychic characteristics and changes. The study was approved by the Ethical Committee of University of Karoli Gaspar, Hungary. The parents of each child and children older than 14 years included into this study provided written informed consent after being informed of the nature of the study. Children under 14 years received both written and oral information about the project. Study participants were recruited from Vecsés City Local Government Department of Children and Family Services, Vecsés, Hungary. Inclusion criterion was: children had to be less than 18 years old and previously participate in the investigation of a forensic expert hence the contested divorce (contested divorce group). In Hungary the jury will subrogate a forensic expert if during the divorce trial parents do not find agreement. Members of the control group from the same age was recruited from the local community by word of mouth; for both examined groups, the exclusion criterion was having had a diagnosis of mental illness in the medical history. Additionally, in the control group, the exclusion criterion was any current or previous psychological or psychiatric treatment in the medical history. It was also a criterion that the trial of the divorce ended 1, 5 years ago, excluding the possibility that the crisis situation is still ongoing. Control group: children whose parents are still together. Measure of Quality of Life for Children and Adolescents(ILK). QoL was measured by the Hungarian version of the ILK scale [25,26]. The ILK scale evaluated 6 domains of QoL: school, family, peer relations, time spent alone, somatic and mental health, and general QoL using 7 items. Both self-report (child version: participants < 12 years old; adolescent version: participants ≥ 12 years old) and the parent version of ILK were used. The adolescent and the parent versions of the ILK used a 5-point Likert scale (1=less impairment, 5=the most serious impairment), while the child version of the scale used faces expressing emotions (laughing, smiling, neutral, sad, and crying) for the evaluation of the items. High scores indicate low levels of QoL. Reliabilities of the self-rated and parent report versions of the measure in the present sample were good to very good (α=0, 76 and 0, 85 respectively). During the analysis of drawing tests we focused on the signs in family drawings. We made a scale regarding the number of those signs that marked bonding damages and dissonance. Adding these two factors together we also observed the damage of the sense of security [23,27]. The coding was done by three students separately; final data were created after consensus had been made. Signs of bonding damages: distance from mother, distance from father, openness of arms, missing body parts, selfposition, filling space. Signs of dissonance: Facial expressions, proportion of figures, preserence of ground, firmness of lines, exaggerated body parts, bizarre elements. We differed these signs in a way that is showed in Tables 1 and 2 and then sorted them in groups. Table 1: Signs of bonding damages. Table 2: Signs of dissonance. Interpretation of the bonding scale based on the signs of the drawing: 1: securly bonding, 0-5 signs 2: unsecurly bonding, 6-10 signs, 3: serious issues with bonding, ambivalence, more than 11 signs. Interpretation of family dissonance based on the signs of the drawing: 1: healthy family atmosphere, 0-5 signs, 2: family disharmony, 6-10 signs, 3: strongly disfunctional family atmosphere, more than 11 signs. Thus we rated the number of signs referring to unsecure bonding and family disharmony. The more signs the drawing had the bigger number it got on our scale. The results of the parent QoL were examined with procedures that tested stochastic equality. First we made a new variable by adding together the answers of mothers and fathers and then we ran the tests. To compare the integrated points of QoL we chose the Mann-Whitney test, but because the O’Brien and Levene tests showed damage we used the rate of the Fligner-Policellotest with Welf's degrees of freedom and the Brunner-Munzel test. The answers of children regarding their relationships inside the family were tested with the Fligner-Policello test because of the damage of the variances’ homogenity. To analyse family drawings we used an ordinal variable with four categories so we ran the Khi-square test, Fisher-egzakt test and Kendall gamma test. 42 children and adolescents were included in the study. The mean age of the participants was 10,62 years (SD = 3,354, range: 5-17 years) in the contested divorce group (N=21) and 10,76 years (SD=2,897, range: 6-17 years) in the control group (N=21). The two groups did not differ significantly in age (t(206)=1.808, p=0,072). Life quality of children and adolescents who have smooth experienced contested divorce was examined referring to their family, so that we could compare it with the results of drawing tests. Children’s life quality connected to their relationships inside the family did not show difference between the examined group and the control group neither in the case of children (FPW(32,4)=0,796 (p=0,4318)) nor parents (FPW(32,4)=0,796 (p=0,4318). During the analysis of dissonance signs in drawings we found significant, medium strong difference (p=0,0132*). This means that those children and adolescents, who did not experience contested divorce, had significantly lower signs in their family drawing tests than those who did (Figure 1). Figure 1: Signs of dissonance in family drawing tests. Here are some of the dissonance signs highlighted and illustrated. A quite common sign was the lack of smiles, often in case of the examined child themselves (Figure 2). Figure 2: Dissonance signs highlighted. Insecure lines were also a typical sign, which is well showed in Figure 3. Figure 3: Damage of bonding. In this drawing (Figure 3) all three signs that were mentioned above can be found and on top of them there are the father’s disproportionately long legs and the encapsulated figures. The latter is also a sign referring to the damage of bonding. Further signs like this are the neutral or negative facial expressions of family members, the figure’s distorted proportions compared to reality, the lack of ground or floating figures, the line’s firmness being too light or too strong. Exaggerated body parts, bizarre, scary, incomplete, irrational elements and objects occurred more frequently in the drawings of the contested divorce group. In family drawing tests the number of signs referring to bonding damage did not differ significantly between the two groups, though after splitting the groups based on age some differences were noticeable. Drawing signs that in our opinion showed insecure bonding were the distance from mother and father, separateness, closed arms, lack of hands or other body parts as well as the drawer segregating themselves from the family or using low percentage of space on the sheet. To examine the relation between the variables we used the Fisher-egzakt test, after adding together the groups that contained more signs. Testing the two age groups together Table 3a and 3b, showed that in the control group there were more drawings that had more than five signs referring to bonding damage, however the Fisher-egzakt test did not reveal significant difference (p=0,2060) (Figure 4). 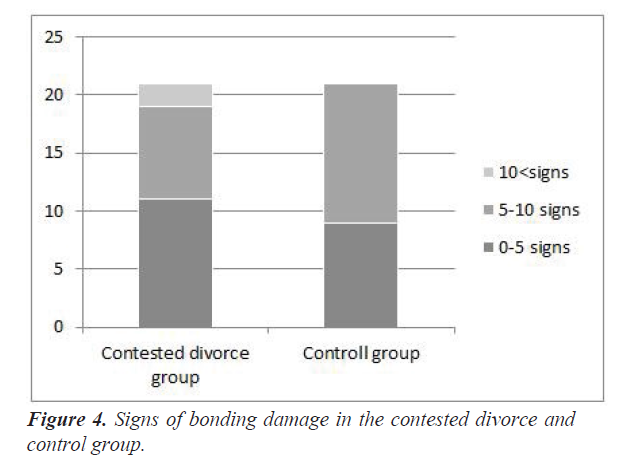 Figure 4: Signs of bonding damage in the contested divorce and control group. (a) Descriptive statistical analysis of drawing signs (N=42). (b) Descriptive statistical analysis of drawing signs (N=42). During the analysis of children under the age of eleven the contingency table showed that in the control group there were less drawings with more than five signs referring to bonding damage, however the Fisher-egzakt test did not show significant difference (p=0,3665). In the case of children above the age of eleven the contingency table showed that in the control group there were more drawings that had more than five signs referring to bonding damage, though again, the Fisher-egzakt test did not reveal significant difference (p=0,2060), (Figures 5 and 6). 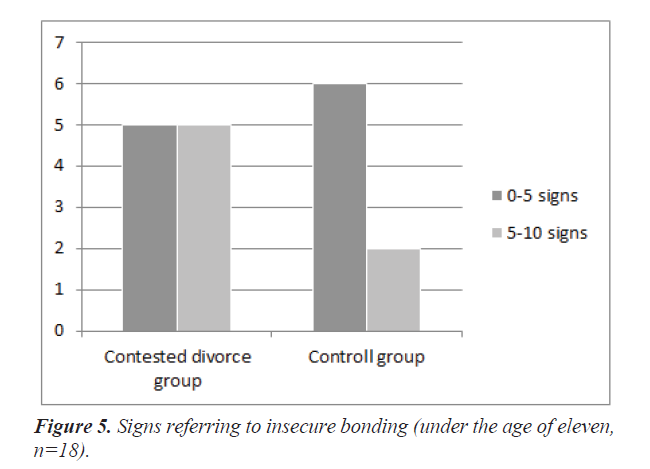 Figure 5: Signs referring to insecure bonding (under the age of eleven, n=18). 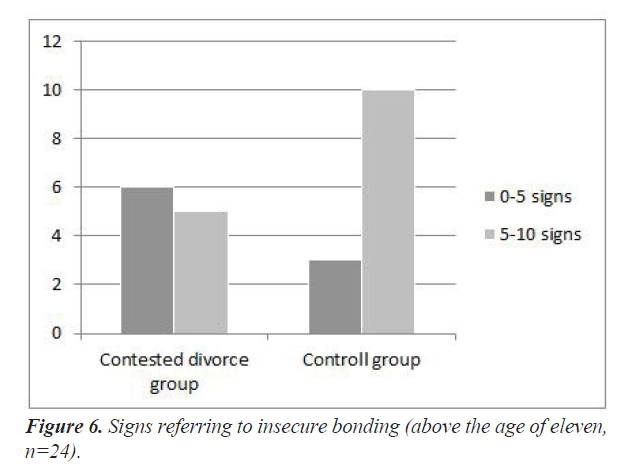 Figure 6: Signs referring to insecure bonding (above the age of eleven, n=24). Family disharmony and signs referring to bonding damage proved to be attached in the case of children who experienced contested divorce. Signs that assume insecure bonding appear in those families that also show signs of family dissonance (7. graphic). The Kendall Gamma test revealed that in the contested divorce group the connection was significant (z=5,508, p=0,0000)***, Kendall Gamma=0,910,) between the signs referring to dissonance and bonding damage. In the control group there was no such connection. In this group only two children showed moderate family dissonance, therefore we did not find significant connection (Figure 7). Figure 7: Connection of family dissonance and bonding based on family drawings in the contested divorce group (n=21). Based on the parents’ answers children’s life quality related to their relationships inside the family did not prove to be significantly different between the examined group and the control group. Even though the research shows that divorce can cause damage to the relationship between parent and child may suffer damage because of the divorce, after asking both children’s’ and parents’ opinion, we found that contested divorce and children drifting away from their family are not necessarily attached . Based on the analysation of the life quality questionnaire of children and adolescents no differences appeared between those who experienced contested divorce, those who did not. This could let us come to the conclusion that (examining only the answers of the life questionnaires) divorce probably does not cause any damage to those functions of family relationships that satisfy psychological needs. But drawing tests showed different results. In this case we only found significant difference between the groups after analysing the dissonance signs of the drawings. Signs of bonding damage did not differ between the two groups. This means that signs of bonding damage showed in similar proportion in the drawings of those who experienced contested divorce and in the drawings of those whose parents are still in a relationship. The reason to this is probably that after divorce children tend to get closer to one of their family members. During the analysis of family drawing tests we found significant, medium strong difference between the number of dissonance signs of the examined group’s drawings and the control group’s. 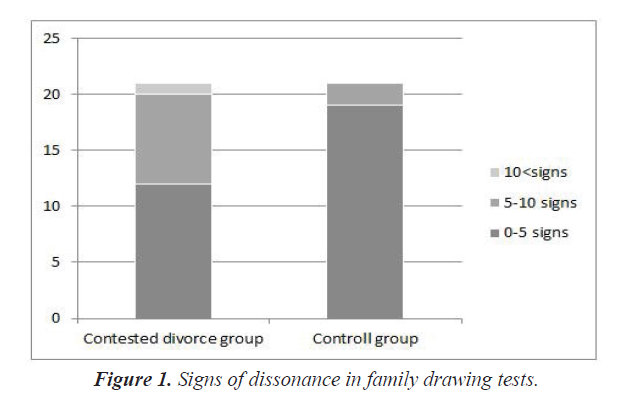 In the drawings of those children who experienced contested divorce there clearly were more signs referring to the absence of family harmony than in the drawings of the control group. Other researches that were based on drawing tests came to the same conclusion too. Roe  compared drawings of children living in different family structures. Children at the age of seven, living in complete, divorced, single parent and patch-work families were asked to draw their families. Those who lived with a step-parent or a single parent were more likely to not draw one or more family members, than those who lived with their biological parents. Stepparents, half siblings, or stepbrothers and stepsisters were more likely to be left out of the drawing than biological siblings. Family members that did not live with the examined child were more likely to not appear on the drawing, than those who lived with them. Children living with both of their biological parents tended to place their parents next to each other. Leaving the absence of the biological father or siblings who lived with the examined child – based on the mother’s narrative – was parallel with the difficulties of accepting the situation . We illustrated the signs of dissonance in children’s drawings which we recorded in the “contested divorce” group. By this we introduced the most common signs that occurred in the examined group. Other researchers also found connection between children’s mental state and drawing signs: they examined children who had difficulties with inclusion at institutions . They analysed family drawing tests and the issues mentioned by a teacher. The strongest correlation was between inclusion issues and these drawing signs: lack of body parts or extra body parts, bizarre elements, lack of feminity. Among girls there was negative correlation between inclusion issues and the preserence of ground, positioning to the middle, closeness to both parents. Among boys there was positive correlation between poor conflict management and positioning to the middle, distance from mother, and occurrence of weird elements . In every case family chaos is a bad influence to children’s mental state, but from the research of Zvara and colleagues  it turned out that everyday disorganization is more harmful than a temporary instable state. Our research confirms that contested divorce ruins the children’s feeling about their family being balanced. With this article we would like to raise awareness in specialists so that in the aftermath of the divorce they focus on helping new families build inner harmony and make this difficult time only temporary. The result that the signs referring to insecure bonding were almost equal in the two groups is thought-provoking. This could be an explanation to the control group having such a big amount of signs of insecure bonding in the family drawings. The reason to the absence of significant difference could be that divorcers’ children do not bond more uncertainly or that divorce in itself does not cause bonding damage. It is an interesting result too that above the age of eleven the control group’s drawings held numerically more signs than the contested divorce group’s drawings. This could be defined by the general ambivalence of adolescents (see control group). At this age people’s relation to the world, to themselves, and to their parents becomes questionable. This phenomenon is less observable on the examined group’s adolescents. This means that those adolescents whose parents’ divorce with a lot of conflict are less likely to have the ability or be brave enough to get free from parental ties. In this case the adolescent crisis is less experienced by them in their child-parent relationship. As long as we are concerned, bonding signs appearing in drawing tests have not been have not been examined yet by comparing the population that experienced contested divorce and the population that did not. Children with ambivalent bonding tended to draw floating, small figures. Children with rejective style showed other specific signs, such as too big and/or incapsulated figures, figures separated by a wall, missing body parts . Another research used six scales, each with five rating points, to measure the latent effect of family dysfunction on children (similar to Fury: family pride/happiness, vulnerability, emotional distance, isolation, tension/anger, inverse role, pathological scales). They learnt that the unorganized, unstable, hard and intrusive parental behavior resulted in the child developing a negative inner model of family functioning and this had the highest rate of family dysfunction that showed on the drawing tests . Our results did not verify the assumption that the parents’ contested divorce can cause bonding difficulties. 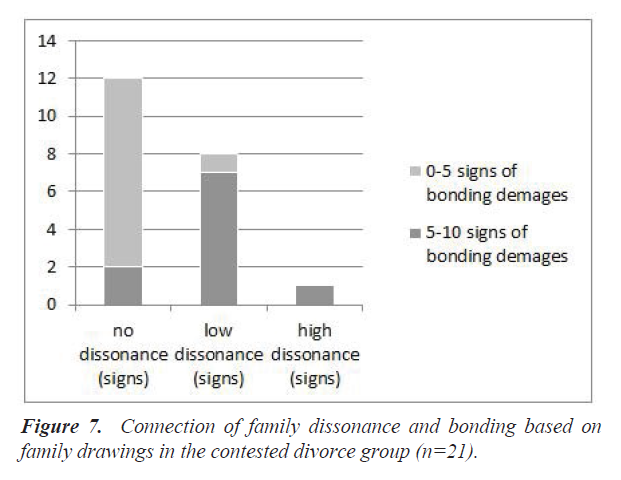 At last our research confirms that in the contested divorce group’s drawings the signs of family dissonance and uncertain bonding are attached. So when the conflict inside the family becomes sensable for the child it can have a bad influence on their bonding style. Insecure bonding has many different reasons, as Hazan and Shaver wrote . 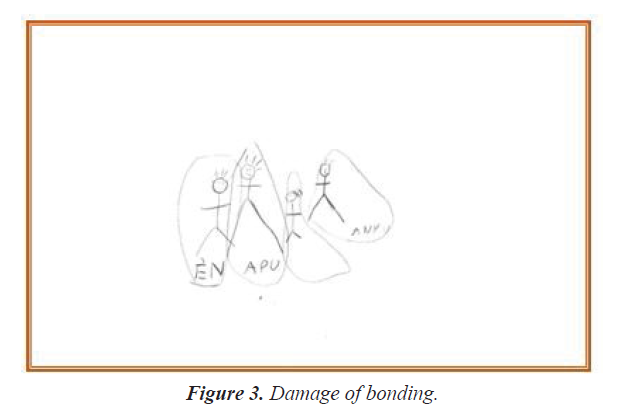 If we assume that bonding style is given (formed by the early parent-child relationship) then we can state that those children, who bond safely are less affected negatively by the disintegration of the family, and because of this they have fewer signs referring to family disharmony in their drawings. This confirms that secure bonding style which forms in early childhood is a protector in people’s lives [30,8]. It is very interesting that the questionnaires and the drawing tests showed different results. If we assume that in a divorced family full of parental conflict the atmosphere is disharmonic for the child, this assumption is confirmed by the drawings but not by the QoL questionnaire regarding life quality inside the family. If we compare the self-filling part’s purposive influencability with our drawing analysis’ influencability, the facts written above doubtlessly prove that drawing tests have the ability to reveal such components that in self-filling tests may be modified by the answerer. Our results could provide important information for specialists both in diagnostics and in therapy. During the diagnostic phase drawing tests could help create a more accurate identification of the child’s psychological state and their relation to their family members. While doing therapeutic work with adolescents, awereness needs to be raised to the fact that in the case of contested divorce the process of separation from the parents can come to a standstill. With this research we would like to draw specialist’s attention to help fresh families create inner harmony and make the phase after divorce merely temporary. It is an important factor at every age in therapy that if the child’s bonding in the original family was not secure then during the process of the divorce it is more likely for the therapist to observe disharmony in them and in their family. As a limitation of our research we mention that our examined group contained 21 children, which is considered a small sample. Therefore precise conclusion cannot be made. Despite this fact the results confirm that it is worth to continue the research, extending the current sample, in order to specify our conclusions. Amato PR. The consequences of divorce for adults and children. J marriage Fam. 2000;62:1269-87. Lansford JE. Parental divorce and children's adjustment. Perspect Psychol Sci. 2009;4:140-52. Potter D. Psychosocial well‐being and the relationship between divorce and children's academic achievement. J Marriage Fam. 2010;72:933-46. Amato PR. Children of divorce in the 1990s: an update of the Amato and Keith (1991) meta-analysis. J Fam psychol. 2001;15:355. Amato PR, Sobolewski JM. The effects of divorce and marital discord on adult children's psychological well-being. Am Sociol Rev. 2001;66:900-21. Booth A, Amato PR. Parental predivorce relations and offspring postdivorce well‐being. Jo marriage Fam. 2001;63:197-212. Carlson MJ, Corcoran ME. Family structure and children's behavioral and cognitive outcomes. J marriage Fam. 2001;63:779-92. Slow ZF, Serfőző M. Family structure, parental treatment and psychological flexibility in adolescence. 2015. Arkes J. The temporal effects of divorces and separations on children’s academic achievement and problem behavior. J Divorce Remarriage. 2015;56:25-42. Fagan PF, Churchill A. The effects of divorce on children. Marriage and Religion Institute. 2012;12:1-48. Anderson J. The impact of family structure on the health of children: Effects of divorce. The Linacre Q. 2014;81:378-87. Strohschein L. Parental divorce and child mental health trajectories. J Marriage Fam. 2005;67:1286-1300. Paquette D. Theorizing the father-child relationship: Mechanisms and developmental outcomes. Hum dev. 2004;47:193-219. Danckaerts M, Sonuga-Barke EJ, Banaschewski T, et al. The quality of life of children with attention deficit/hyperactivity disorder: a systematic review. Eur Child Adoles Psychiatry. 2010;19:83-105. Michel G, Bisegger C, Fuhr DC, et al. Age and gender differences in health-related quality of life of children and adolescents in Europe: a multilevel analysis. Qua Life Res. 2009;18:1147. Downey HK, Slocum JW. Uncertainty: Measures, research, and sources of variation. Acad Manage j. 1975;18:562-78. Vass Z. The psychodiagnostic basis of the drawing examination. Projection, expression, patterns. Budapest: Flaccus Publishing House. 2013. Baltrusch HJ. Clinical-psychological experiences with the figure-drawing test: First communication: The test, its application and evaluation, explains its own results. J Psycho-somatic Med. 1956;3:29-40. Vass Z. The information quantity of projective drawings and its psychological meaning. 2012. Burkitt E, Barrett M, Davis A. Children's colour choices for completing drawings of affectively characterized topics. J child psychol psychiatry. 2003;44:445-55. Goldner L, Scharf M. Children's family drawings: A study of attachment, personality, and adjustment. Art Ther. 2011;28:11-8. Attili G, Roazzi A, Toni A. Children’s family drawings and attachment. A multidimensional scaling approach to study Internal Working Models Children’s family drawings and attachment. A multidimensional scaling approach to study internal working models. 2016:111-22. Fury G, Carlson EA, Sroufe A. Children's representations of attachment relationships in family drawings. Child dev. 1997;68:1154-64. Zvara BJ, Mills-Koonce WR, Garrett-Peters P, et al. The mediating role of parenting in the associations between household chaos and children’s representations of family dysfunction. Attachment Hum Dev. 2014;16:633-55. Kiss, Mtsai. ILK QoL questionnaire (Inventory of quality of life in children and adolescents – ILK. 2007. Mattejat, Remschmidt. ILK QoL kérdőív (Inventory of Quality of Life in Children and Adolescents - ILK). 1998. Kaplan-Main. Family Drawing classification groups. Attachment and Human Development. 1986;441. Soósné KZ, Nagy N, Szilák Á. Impact of divorce on children and parent-child relationship. Health Promotion. 2011;22-30. Roe A, Bridges L, Dunn J, et al. Young children's representations of their families: A longitudinal follow-up study of family drawings by children living in different family settings. Int J Behav Dev. 2006;30:529-36. Hazan C, Shaver P. Romantic love conceptualized as an attachment process. J Pers Soc Psychol. 1987;52:511.